Because who doesn't love midweek adventures when we all have to work in the morning? It’s a rite of passage this week, as this marks Jason’s first official pick as part of our WTGW crew. Because after a certain number of weeks dining out with the group you’re forced to stop freeloading and take responsibility for some of the sketchy choices we’ve made over the years, as well as the judgmental, sarcastic commentary that follows. Needless to say he was a little nervous. Boy Scouts would be proud. Once we finally found the place the concern switched to whether or not we would actually get a table prior to the 9PM closing time, as the parking lot looked packed and the building looked way too tiny to hold all of the people that would’ve arrived in said vehicles. It turns out that the building is deceptively small looking, and they probably want to think about expanding that parking lot. Upon entering we realized that the easiest way to a hostess’ heart is to tell them you have no preference between indoor or outdoor seating, as she proclaimed she loved us after that statement. We figured that given the number of cars in the parking lot and the vacancy of the indoor areas, we would most likely not see the likes of a patio this evening. We were wrong. The hostess led us outside to the patio, where we discovered not only the owners of most of those cars in the parking lot, but also an amazingly beautiful patio situated next to what I’m assuming must be the namesake Tinker’s Creek. It was like being in a whole other world. Or on vacation somewhere not in northeast Ohio. Which, with Ted in the driver’s seat, isn’t all that difficult a proposition. How long were we in the car, exactly? We showed our appreciation for our new environment from the very beginning, as we became what I can only assume were the most agreeable table ever to set foot on this particular patio. Drink menus? Yep, hand them over. Waters for everyone? Sure! With lemon? Why not!?! Cassi put the brakes on our enthusiasm train when she realized that the extensive drink menu didn’t include pricing, and had to ask the server how much the various cocktails and craft beers were going for. All heed the lesson of Shane and the unknowingly overpriced craft beers of a few months ago. While we weren’t fans of the price guessing game, we will give kudos to the server for not only unbegrudgingly going to check on them for us, but also actually knowing the differences in the various beers on the menu. When Jason asked about the flavors of the different IPAs, she gave real references, not just the generic “they all taste like beer, what more do you want?” conversation we’ve had in some establishments. 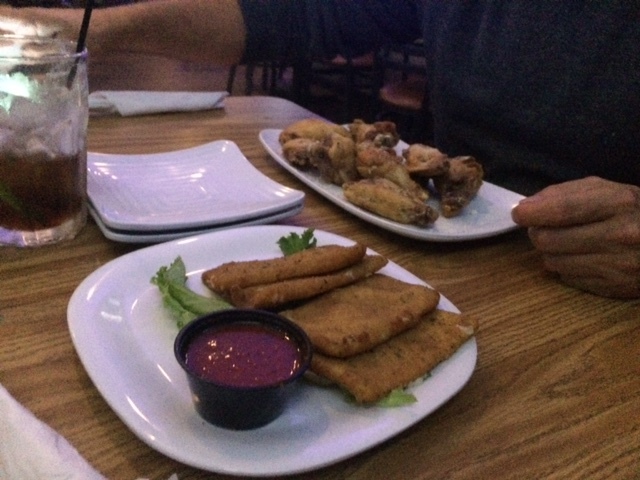 Of course we ordered appetizers, because we were happily agreeing to everything … and also, well, because we’re us. Following the food envy of the potato cups at Wil’s Grill a few weeks ago, I lobbied Shane to order those. They were good. Not overwhelmingly so, and they didn’t have the “holy crap that’s a lot of melted cheese” wow factor that the ones at Wil’s had … but I would order them again. Cassi and Jason ordered the fried mozzarella. It was tasty. Cassi said she would rate it higher than her old favorite – although she kindly didn’t mention the restaurant where that dish resided. I’m not sure when we suddenly got so courteous. Ted, in spite of voicing his disappointment that no one decided to order the eggplant stack, opted for calamari. He then proceeded to rave about it for the rest of the time it was on the table. Apparently his sorrow over not getting to try the eggplant stack was quickly forgotten. He said he’s not really one for top five lists – a statement that seems like it could factor into a severe punishment from certain members of this group – but if he was then this calamari would be on it. It was breaded well, and the sauce was an excellent compliment to the flavor. With an endorsement like that, of course we all tried a bit of it when offered. Shane thought it might’ve been a bit of a trick, since it seemed like if Ted was truly a fan then he shouldn’t have been willingly sharing it so much with everyone. Regardless, we agreed, it was really good. 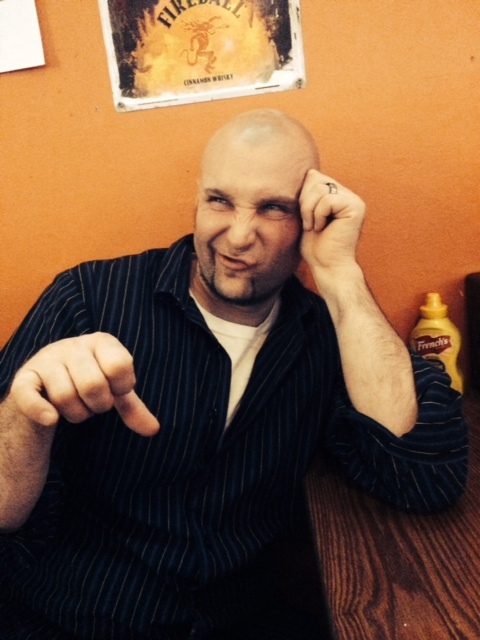 Also not new to us, but likely an intro course for our server: Shane’s obligatory firing range of questions related to the best items on the menu. 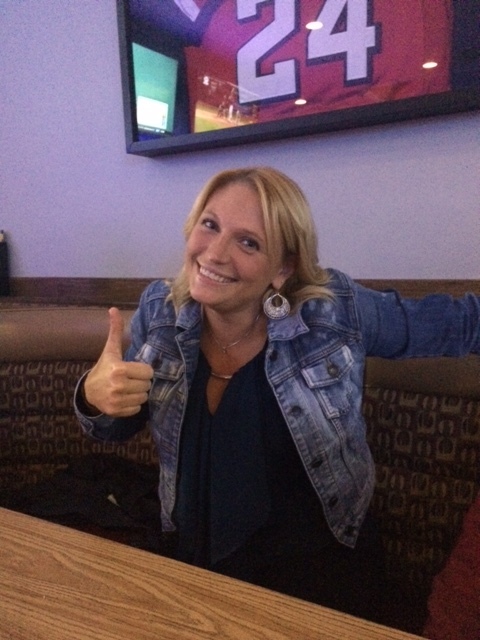 I’m happy to report she survived the assault, listing several dishes that she personally enjoys, from the mac and cheese, to the salmon, the pulled pork sandwich, the salmon salad and the brisket sandwich. Now if she truly wanted to be a member of our group she would say that she once ordered all of those items in one sitting just so she could compare them all and come up with a final true winner. But, alas, that food challenge never happened. Something to think about, though. Shane followed up that interrogation by ordering nothing that she recommended, and instead asking how large the portion size was on the eggplant parmesan. Because we all know how much size matters in these instances. Get your mind out of the gutter, kids. Especially for when I tell you that her response was that it’s giant, and Shane’s response was that he would take it. But at least she wasn’t lying. When the food arrived, I think we all had our own “holy crap, I’m supposed to eat all of that in one sitting” moment as the plates were set in front of us. This photo doesn’t do justice to the size of the bowl. Although the sheer amount of cheese displayed here should give some indication. Let’s just say that Shane immediately regretted letting his hunger take the reigns and ordering the extra side of onion rings to accompany his eggplant parm – ironically not because those two things usually are never ordered together as one meal, but because he could barely make it through the actual dinner portion of his meal without being overly full. His eagerness at the question “would you like a box for those?” was very much diminished from the reaction to the questions at the beginning of our meal. Speaking of side orders of things that didn’t get eaten in their entirety, I spent a few minutes dispelling the advances of Ted and his overly aggressive forcing of his wee basket of tater tots into my face. Little did I realize he was just trying to make sure they got their proper photographic documentation, and not trying to force feed them to me. The joys of being the official photographer. More on that later. In the category of foods Ted didn’t try to shove in my face, Ted also got the smoked chicken sandwich. He said it was good. His rating system on his meal this evening pretty much went as follows: Chips just OK, sandwich and tots good, calamari excellent. Use that information as you will. In true girl fashion, I give bonus points to the tots for being contained in one of those cute miniature fry baskets – which of course we all tried to convince Ted he should just walk out of the restaurant with instead of asking for a box for his remaining tots. He did neither. Which makes me think they weren’t as good as he said they were, and he also clearly doesn’t appreciate interesting servingware. Jason got the baked cod sandwich. He liked it, saying that the fish was very moist. Although part of that verdict may have just been so that he could use that particular word and annoy the hell out of his fiance, who has on more than one occasion announced her dislike of it. Cassi and I both ordered the tacos – I got the grilled steak tacos with chips and salsa, while Cassi got the tilapia tacos with sweet potato fries. We both said they were really good. And we agreed with the table sentiment that the server was not incorrect in her statement that no one will leave hungry, since each meal came with three large tacos, plus a generous portion of the side. We each took one of our tacos home. In retrospect, we probably could’ve done without all of the apps at the top of the meal. I’m making that note for our eventual return visit, although I already know we won’t heed it. Remember when I mentioned that the place closes at 9:00? Yeah, that’s not a typo. The place definitely starts emptying out after the early dinner rush, and by 8:30 we were one of only a couple tables left. I know this for certain because any table not inhabited was bring cleaned and upturned and pretty much sending a solid message that diners arriving at 8:55PM might have technically still arrived prior to closing time, but also were more likely to be served in a less than appreciative manner. Just speculation, of course, but I for one am not willing to test that theory. Another thing we decided against testing: our ability to read a very large sign on a gate stating “NOT AN EXIT,” and the server’s patience when said sign is blatantly ignored. We watched in amusement as one couple tempted fate in this manner and was scolded openly – and righteously, in my opinion, as I mean … come on … there’s a sign. It’s pretty clear that just because the gate opens doesn’t mean they want any random person using it. The reasoning may not be clear, but the sign is … and that’s what matters. But aside from the early closing time and the questionable use of lighting on both the patio and the parking areas, I would give this place a high thumbs up. You wouldn’t know it, though, because these are the only photos we attempted before giving in to the questionable lighting gods and admitting defeat. Now whose turn is it to find the worst lighting possible? No thanks. I’ll just stick to words to tell the story. The service was good, the portions were huge and tasty – and the patio really is a great space to spend a nice summer evening. They even brought us citronella candles for the table after we mentioned our dining experience was quickly creating a feast for various bugs as well (sitting near water + humidity = mosquitoes. It’s just science). And if you’re lucky, maybe you’ll even spot this strange creature in the parking lot on your way out. Remember that time we passed by a super sketch place called Johnny T’s and I vowed never to let Shane pick it for Fun Wednesday? That same place is now called South End Tavern, and I’m guessing have new owners? Or maybe they just thought a name change was in order? They certainly didn’t think cleaning up the junkyard of old cars out in back of the place was a task worth undertaking. The same old ghetto limo was still parked under a pile of snow at the far back of the parking lot, and they still have the same strange fenced in area in the middle of the lot that we think might be a sand volleyball court? Or just a really high caged in patio – which seems odd, but whatever. Wednesdays are apparently trivia nights – we speculated that this may be a newfound marketing scheme along with the name change to bring in more of a crowd. And it worked, because the place was busy … until about 8:30pm. Which, considering the crowd, could potentially be when some of them went to bed. Or maybe the place started to clear out because the first round of trivia took upwards of 90 minutes. Granted we don’t usually partake in trivia, so we don’t know what normal time usually is, but that seemed excessively long, no? We joked that we had no idea how many rounds there were, but there was a good possibility we could pull an all-nighter staying for all of them. Sidenote: we also overheard someone announce “there’s our competition” when our group walked in clearly looking like we’d never seen the inside of the place before and scouting out a table. Being that we had no clue at that point that it was trivia night, that was definitely taken out of context. But then Cassi read the words “Trivia Night” on the super fancy mirror of specials along the back wall, and we were set straight. I feel sorry for whoever they borrowed lipstick from to write all of that. Also, 1984 called and would like it’s communication devices back. We ended up sitting at the bar – because even though the place is fairly spacious inside it only has like three actual tables. Because that’s helpful. I think we all came up with some interior design rendition in our heads that could’ve both eleviated that problem and helped with business, but what do we know. It’s also worth noting that sitting at the bar – in close proximity to the one bartender who is responsible for the entire place – doesn’t necessarily ensure faster service. So there’s that. Beers for the guys (they actually have a decent draft list, lots of local crafts) and tequila and soda for me and Cassi. And when I say that, I mean that I think Cassi and I shared an entire bottle of well tequila between our two short glasses. A whole forest of lime trees couldn’t save that disaster. So needless to say we only had one round of those, and switched to beer. Obviously we had to get in the jokes about how – given the size and look of the place – we were a bit apprehensive about the menu options. Shane actually hoped they would only be serving wings and burgers, since he’s still trying to redeem himself from that place in Ellet. Cassi admitted she was crossing her fingers that we didn’t manage to sink below that pick to a place that only serves bar snacks and jerky sticks. Two sided! Look at all the options! We also took those pictures of the menus because you’ll be hard pressed to find any mention of the menu online anywhere. So, you’re welcome. How can you go wrong with tiny fried potatoes and cheese? So no soggy bottoms tonight. Check. The nachos may not have gotten that rave of a review, but they were still good. The salsa had good flavor, and the toppings were abundant – although I’ll admit it didn’t really look like it when we first got the dish, but then once we dug in it seemed to be bottomless. Ted ordered his usual two whole meals, so who really needs apps? 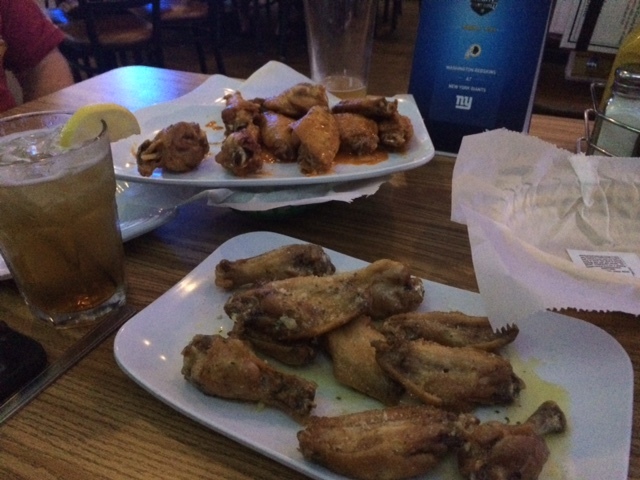 I’ll give the bartender credit, though, as she tried to make sure Ted’s wings came out with our apps, so that we all had food in front of us at the same time. The only problem is that she got Ted’s and Shane’s wing flavors mixed up, so when the Smokehouse wings showed up and Shane claimed those, it meant that Shane had an app and his entire meal, while Ted still had nothing. Of course we were all more concerned about the fact that Shane ONLY ordered wings – no burger, so pizza, nothing else. What’s wrong with him? Is he trying to starve himself? He said the wings were just OK. We all commented that they looked like tiny pieces of fried chicken. Which seems like it would be good – but Shane said that they didn’t have much flavor. Ted got the Carribean jerk wings – which, after the bartender realized her mistake, she worked really hard to get out quickly. Kudos for that. Ted also agreed that the flavor was lacking a bit. He also got the BBQ bacon burger. As did Jason. Hmmm, maybe Shane has some competition in the bromance department? 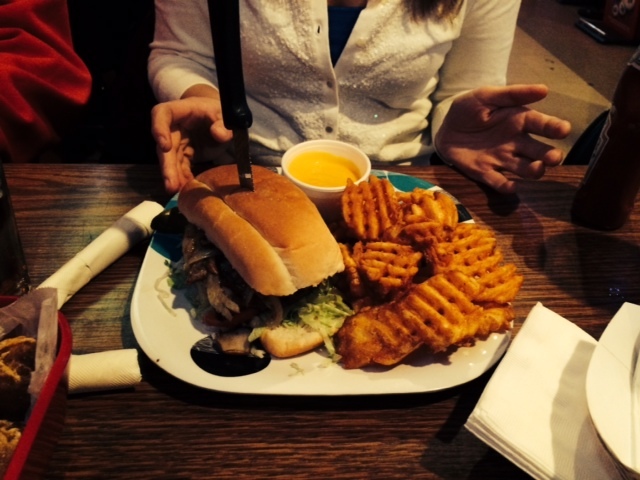 Ted thought the sauce on the burger was sweet – like unexpectedly sweet – and that the bacon was very tough. I mean, not wings from a pizza pub tough, but still. Meanwhile Jason thought the sweet sauce was exactly what made the burger good. So maybe they’re not food soulmates after all. We tried to make them fight it out but they didn’t go for that idea. 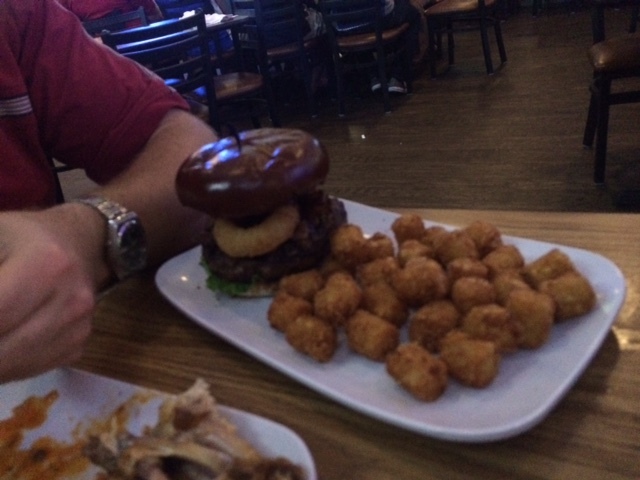 I got the southwest burger with tots. 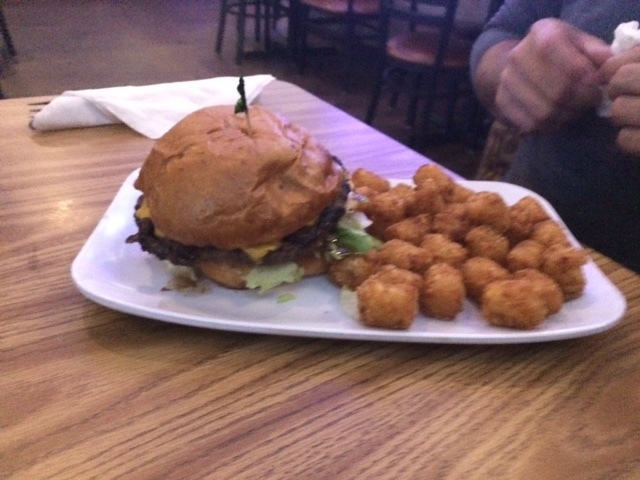 Cassi was right – the tots were delicious. And the burger was very good. Good flavor, toppings not overwhelming but enough to give it something more than just the taste of meat and bread. Cassi got the steak philly with sweet ptato fries. She said it was excellent. She would come back just to get that sandwich again, it was that good. Overall the crowd was odd, the mixed drinks weren’t good, and the bartender was nice but more than a little flaky … but the food was surprisingly very good and they had a decent draft list so I guess if that’s what you’re in the mood for, you’re golden. They also have a large projection TV facing into the odd little room across from the bar so at least while sitting where we were at the bar we were entertained – but note that two of the space’s three existing tables are also right there in the path of the projection (and they’re high tops to boot), so if you decide to sit there you may end up either being part of the show or wondering why everyone keeps staring at you as you try to eat your sandwich. And there may be a patio out back – I mean, aside from the large high-fenced in area – so we might have to return when Mother Nature finally decides to grace spring upon northeast Ohio and check that out. In tonight’s episode of “let’s face intense weather conditions just to go out to a dive bar and enjoy food and drinks,” Mother Nature throws a giant snowstorm in our faces. So obviously we still are not friends. For the record, I have to believe there are more subtle ways to remind us of this, but whatever. In light of that, Shane was supposed to be choosing someplace close to home Which totally explains how we ended up in Northfield. Good call. The last time we went to Pat Dees, Shane was working late so Ted and I drove separate and met him there, along with Amanda and Jerrid. That night there was a driving downpour rainstorm. So I guess the moral is that we can apparently only visit this place when some sort of precipitation is falling from the sky. Which is also fun because each visit seems to bring a giant debate about how exactly we get inside the building. Because loitering around outside in rain and snow is a super fun way to start an evening. There’s a door at the very front of the building, and another hidden behind the covered patio that is hardly visible from the parking lot. Guess which was the right one? I mean, why make it obvious. The place also sort of resembles a house from the outside. What is it with Shane and these places? Shane orders a rum and coke, Ted gets a Christmas Ale (after his usual dark beer inquisition) and Cassi and I get tequila and sodas. Hers arrived with the extra bonus of a dead fruit fly floating in the glass. Thanks for the extra free protein, but maybe ask next time before just assuming it’s what we wanted, k? For apps it was breaded mushrooms for Ted and for Shane and me, with Cassi choosing tater tots. It’s still a vegetable, right? The mushrooms were apparently cooked directly on the surface of the sun. I picked one up and promptly lost a layer of skin on my fingers. I then tried to caution Shane – since he usually needs his food of any kind to be chilled to almost ice cream level – but he was in the middle of a story and ignored my sign language warnings … so he ate one anyway. I wish I had a picture of his face as that happened. But regardless, no longer having taste buds didn’t deter us from ordering and eating enough food for us and our 15 imaginary friends. I got the battered fish dinner, after debating between that and the corned beef. Truth be told I probably should’ve gone the other way. The fish was just OK. And I probably would’ve preferred real tarter sauce to the packets they provided me with. Because after the fruit fly incident, who knows how long those have been lying around. I also remembered quickly what I didn’t like about our last visit to Pat Dees … the battered French fries. Because we need to make them more unhealthy? Ted got 12 of the Cajun wings and a hamburger. The burger was average, according to Ted. I have to be honest that it looked a little less so from my side of the table – also especially considering what we ate on our last WTGW evening out. But he seemed happy enough with it. The wings were another story, though, as he had ordered them “wet,” and they arrived actually as dry wings but covered in some sort of grease. Or maybe motor oil? Thick, gelatinous liquid at the bottom of the basket is always a good sign, no? Cassi got a pizza with pepperoni and mushrooms. She really liked it, and said that she thought the crust in particular was really good. Her only complaint was that the sauce was a bit too sweet, and there seemed to be too much of it on the pizza. How come there’s never too much of something we really like on pizza? Like cheese? I mean, just sayin. 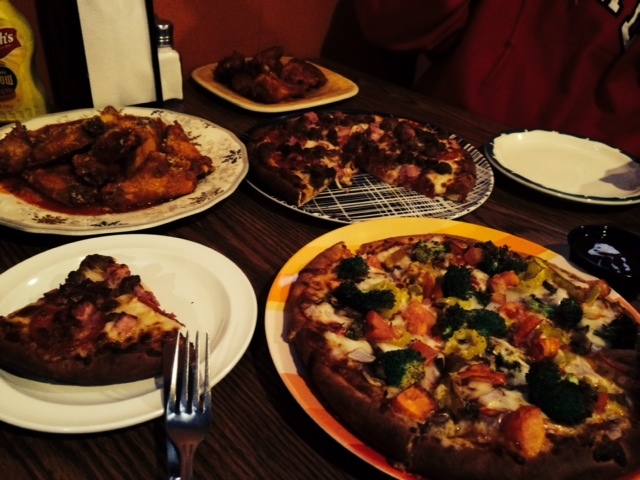 Shane also opted for pizza with pepperoni and mushrooms – and also added Italian sausage. 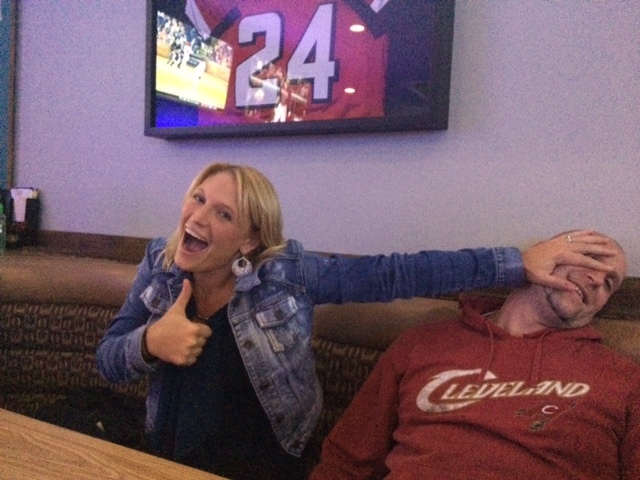 He disagreed with Cassi’s observation that the sauce was too sweet, but agreed that it was pretty good overall. Side note – we later heard a new table behind us try to order a pizza and they were told the place ran out of pepperoni. I think we may need to take responsibility for that one. Shane also got six garlic parm wings, a decision he regretted later not only because he was too full after eating only half of the pizza to even touch the wings … but, well, he realized there was some sort of science experiment happening with his wing basket about halfway through our meal. Seriously, what the hell is that? Oh good, it hardened. That’s helpful. By the time the server came over to see if we needed any boxes, Shane’s wings were pretty much glued to the table. She was slightly disapproving and judgemental about the grease slick when Shane pointed to it saying he needed a box. Something tells me this isn’t the first time she’s seen this, so maybe she sould redirect that burning judgement to ownership in purchasing some heavier duty wing baskets. So basically the moral here is that if you choose wings, you either get them in motor oil (Ted) or Crisco (Shane). Interesting flavor choices. I can see why they didn’t list them on the menu. Ted, regarding the grease imprisionment of Shanes wings: Well, of all the places we’ve been we can say weve never seen THAT before. So basically the consensus is that Pat Dee’s wasn’t our favorite place the first time around, and it’s still holding court at that spot now after a revisit. I’m not exactly sure what Shane was remembering that made him want to return. Maybe he found another door somewhere to a better place? OK, so first of all, if you’re going to have a front door, placed strategically underneath your establishment’s sign and with a path from the parking lot leading straight to it, said door should probably be functional, no? I mean, call me crazy and all, but it doesn’t seem that out of reason. That was just our initial thought, anyway … as Ted and I were adventurously touring the exterior of the building trying to find the way in. So that was fun. Because nothing screams “we’re new here” like walking around buildings in the pouring rain looking for the entrance. To Amanda’s credit, she had her eye on the large circular table with the pretty floral tablecloth, but, alas, it was taken – so we were stuck with a rectangular table draped in plain white. So much for ambiance. While we’re talking about the layout of the place, I should mention the other thing we found slightly weird – which is the placement of the restrooms. In the exact center of the room. Hmm. It kind of reminded us of that dark and somewhat scary place in Richfield where Ted got the meat on the stick. Shane was working late this week, so we kind of showed up to Pat Dee’s in shifts – Amanda and Jerrid first, Ted and me second and then Shane. Amanda and Jerrid already had their Miller Lites when Ted and I arrived, which is where I landed on the drink scale as well. Ted went with a Jack & coke because, well, it was just easier than asking our soft spoken and semi-hard-of-hearing waitress anything about the types of beer they actually had there. Jerrid and Amanda decided to share a pizza, as they heard it was supposed to be one of the specialties – and since they don’t live far from the place, it could potentially end up as a good carry out option in the future. They went with the make-your-own option, choosing pepperoni, mushrooms and black olives. One side of the oven is clearly a bit hotter than the other, no? 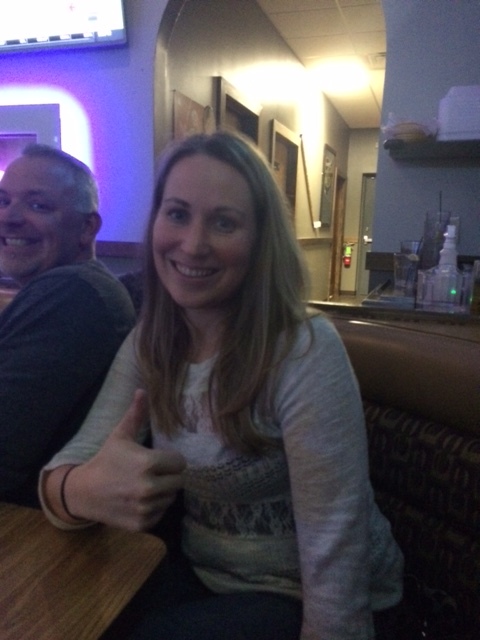 Amanda commented that the pizza was definitely fresh – and not frozen with just some extra cheese thrown on it like that place we went to in Solon that to this day we still can’t pronounce. Also, in the great “is the sauce sweet or not” debate (second only to the “are your burgers made fresh and how thick are they?” quiz in frequently discussed topics by our group) she said this one was not, but that it was still very good. They both agreed that the take out option was very likely. So, score. Jerrid also got six of the garlic wings. Which came out with actual chunks of garlic on them. How is it we continuously find these places that serve garlic in this fashion? I think by this point with the sheer amount of garlic this group has consumed this way we would pretty much be immune if some sort of vampire apocolypse occurs. He saved one for Shane, because he knew it would be right up Shane’s alley. And, well, bromance. 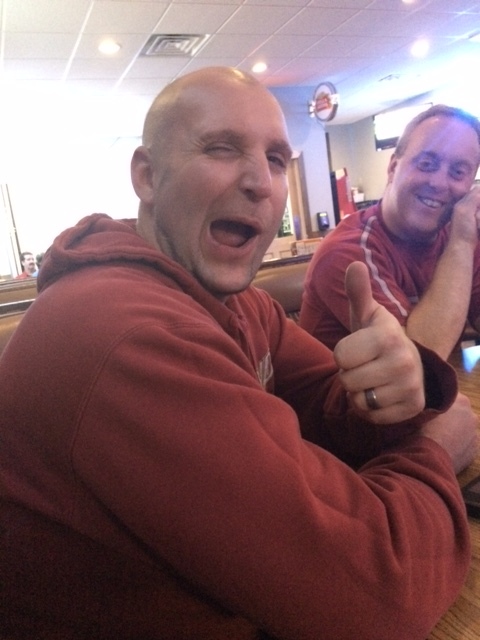 Ted got six of the cajun wings … in addition to the full ribeye steak dinner. Because, well, that’s how we roll in this group. The wings were quite large, especially for the price, and he said they were good. He didn’t say as much about the steak, but he did slather it in A-1 as he was eating it, so I can only assume the wings were the better part of that particular meal. I got the half pound burger with Swiss cheese and mushrooms. I was surprised to find when it came out that it was served on ciabatta bread – which anyone who knows me or reads this blog by now knows you may as well have served that burger to me on a stack of $100 bills, because that’s how rich I felt at that moment. Ciabatta bread = a special slice of heaven for Steph. Usually I eat the burger but surrender the bun halfway through when I don’t have room in my belly to finish the meal … but in this case I was really torn. The burger was really good, very well seasoned and definitely made fresh. But I did leave just under half of it on my plate because … well, ciabatta. I was really having an internal debate with my stomach at the end of my meal for not just being a team player and letting me finish all of it. So it makes perfect sense that the next time the server came around he asked for an order of cheddar poppers, too. There’s the Shane we all know and love! Shane didn’t say much about his meal – but, like Ted, also used an unusual amount of steak sauce with his dinner, so I’m guessing the steak was a bit on the dry and overcooked side. However, it was cheap, so that helped him choke it down a bit easier I think. For the third WTGW in a row we came in at a record low tab for the amount of food we consumed, with mine and Shane’s just barely reaching $45. 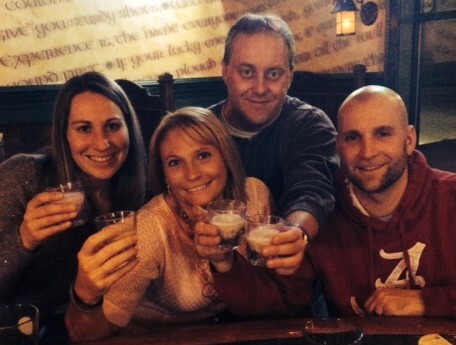 All in all, Pat Dee’s is a great little neighborhood bar. You can tell there are definitely regulars, and Jerrid and Amanda said when they arrived it was busier and it seemed like those people were served a little quicker. But I don’t think it was done with malice – more like just that the waitress knew what those people wanted and got it out of the way first before they got upset with her. Better to take care of the people who will never let you forget how long it took to get their food when they come in the next week than some randoms who you may never see again, right? There’s a reasoning to that, I imagine. But that being said, we weren’t treated as outsiders, or judged because we sat at someone’s particular table. Which, speaking of, I wonder how many times we have to come back before we can reserve the circle table with the festive tablecloth? Just a thought. See also: why is there a hand growing out of my back and a head attached to the side of my face? Can we just talk for a moment about how Shane looks the same in all three photos? Drinks: If you like domestic beer and mixed drinks, you’ll do well here. If you’re looking for something fancier, well, yeah, you’re definitely in the wrong place. For many reasons. Food: The menu isn’t huge, but it does have a little bit of everything. Although if you want anything healthy you might want to follow the craft beer drinkers right back out the un-clearly marked front door. Service: Unfortunately for us we aren’t fluent in “mumble,” so our server – while very nice – was a bit difficult to understand. Overall: While I think our group brought the median age of thier patrons down a few notches, this is definitely a great little neighborhood place for a quick meal or drinks with friends. Hey, we’re not in Canton this week!?! What? But we did still visit a place located in a strip plaza, if that makes you feel any better. Redemption. Amanda had noticed this place while driving by with Jerrid one day, and apparently immediately exclaimed that she was picking it for WTGW. 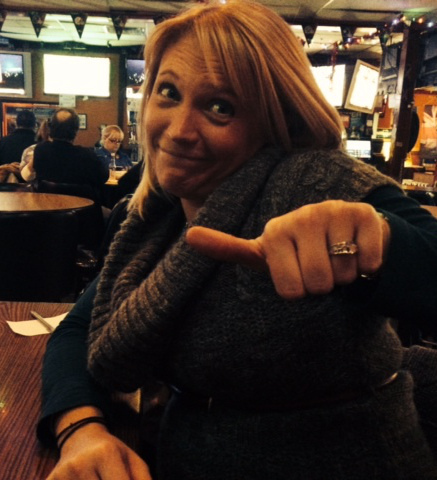 Unfortunately Jerrid is still relatively new to the “rules” of WTGW – like how it’s perfectly acceptable to yell out “I’m picking it!” when you see a random dive bar or new restaurant in passing – so she was kind of jumping the gun a bit on that one. It’s like when you’re on a long, boring car ride and suddenly decide to play “slug bug” with someone who clearly didn’t know they were part of the game. We seemed to show up in shifts for this week’s adventure, with Amanda and Jerrid arriving first, Ted and I next in line, and then my over-achieving and workaholic husband arriving last. That being said, Shane had some catching up to do on drinking when he got there, and went straight for the Long Islands. Well played. Meanwhile it was Harvest Patch shandy for the rest of us (hey, it’s only available through October, we have to take advantage while we can!) and Jerrid went with a Jack & Coke. Our server was honestly one of the best parts of our visit to Beer & Belly. Her personality had just the right mix of sass and sarcasm (which is a true compliment from someone who strives to achieve that balance pretty much every day of her life), without going overboard and making you feel like you just sat down to dinner with the Plastics from Mean Girls. Server: Do you want talls? Server: I would hope so, our motto around her is go big or go home … and I’d hate to ask you to leave so soon. Server, looking directly at Ted: The Cowboy Burger is delicious. It has this pepper jack cheese on it that really gives it a good, spicy kick, really amazing. Entire table: Um, yeah, you’re telling the wrong person. Ted hates cheese. Server: What the hell is wrong with you? Who doesn’t like cheese? That’s insane. I don’t even know what to think about you. If we were 10 years old and back in the 5th grade, at that moment I think we all would’ve been fighting over who got to claim her as their BFF. Although it should be noted that her sass didn’t sway Ted from actually ordering that very burger, so I guess there’s a twist of irony there. Actually, he had had his order all picked out, but then once Shane began the interrogation process and our server started listing all kinds of other yummy things he hadn’t bothered to take the time to consider … Ted got befuddled and just picked the cowboy burger. Minus cheese. On a pretzel bun. With tater tots. He also ordered wings, because, well, not only are Wednesdays 50 cent wing days – but if you’ve been paying attention these last few weeks you’ll notice that the boys in our group seem to consider them the ideal “first course” for a meal. You know, some people do side salads or soup to start off, these guys do wings. Whatevs. In any case. Ted got the Hot Garlic, which was apparently really, really good because he nearly licked the plate clean once he finished the actual wings. Maybe we really are 10 year olds. 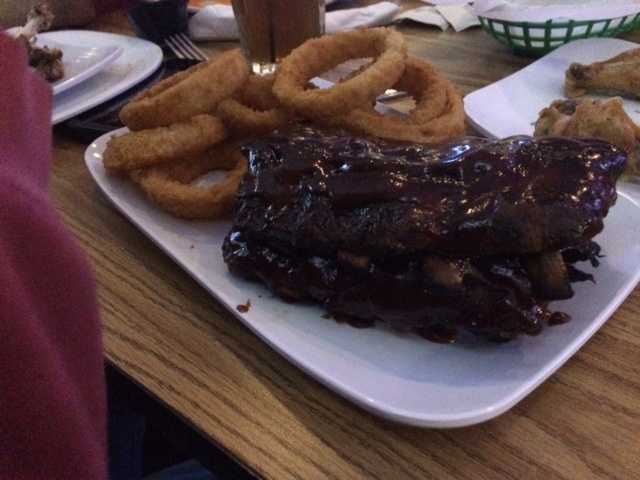 Shane ordered the ribs (twist his arm yet again), after hearing from our server that they were “very good, not fatty at all, very meaty.” You could practically see Shane’s face light up when he heard that. He got onion rings as a side. And for his wing option, he chose the garlic parm. Which, once again, if you’re following along here at home, you probably realize is nearly an exact clone of his order last week. Well, except swap the “parm” on the wings with “honey.” Which would of course make them disgusting in the process, so no thanks. I have a feeling “honey garlic” is going to become the new “tarter toast” within our group. Just sayin’. Rounding out the guys orders, Jerrid went with the Belly Boy burger, which the server likened it to a Big Mac – right down to the special sauce. And tater tots instead of fries. Clearly we’re exercising all of our side dish options at the table this evening. He also chose the garlic parm wings. And mozzarella planks – which, if you’re wondering, are really just mozzarella sticks that look like they were run over by a steamroller. Clearly his appetite alone causes him to fit in well with this group. Us girls went the burger and no wings route for our orders this time around. 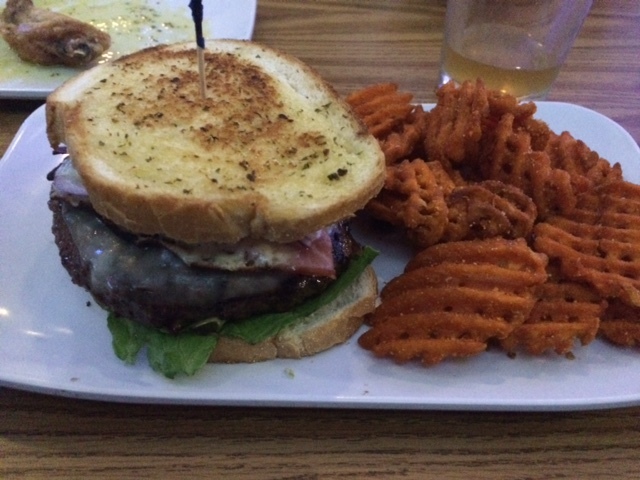 Although I actually have to credit my choice – the Sicilian Burger – to Ted, who had questioned it during the server interrogation portion of the evening. His question was something along the lines of “does all that stuff come on top of the burger? Because it kind of seems to have a lot going on on it’s own without even throwing a burger underneath all those toppings.” So out of sheer curiousity it ended up as my meal. I mean, as a kid I used to love Roman Burgers at Mr. Hero – and this sounded pretty similar. And since we’re apparently reverting back to our 10-year-old selves with this week’s adventure, I guess it was only fair to choose that as my meal. FYI, the Sicilian Burger actually wasn’t all that similar to the Roman Burger – other than that whole Italian name thing anyway – but it was still OK. I got it on the Italian garlic bread – you can choose that, a pretzel bun or regular brioche bun – and I mean, I figured if we’re going for a theme here then that just makes sense, no? Plus by now you know how easily I can be swayed by delicious sounding carbs. Unfortunately, I choose poorly. I imagined this to be like Texas toast, but in reality it was just plain old thin sliced Italian bread with garlic seasoning. Definitely not sturdy enough to even hold the burger in. 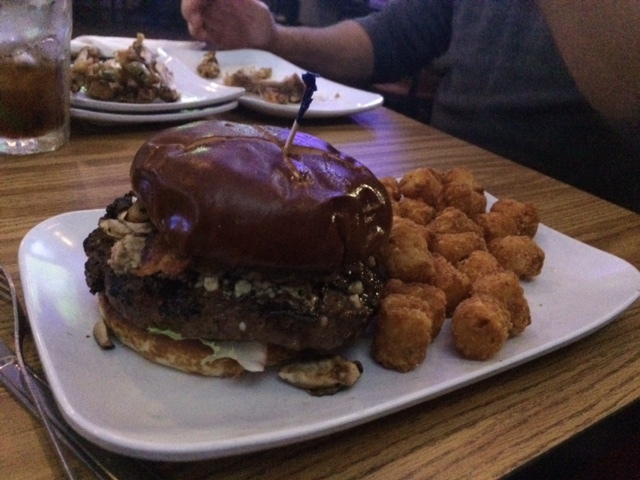 I ended up eating just the burger (which was good) without the bread and all the meat toppings – which kind of did have “a lot going on there,” to quote Ted. But the sweet potato waffle fries were good, so there’s that. And I salivated over Amanda’s pretzel bun, which thoroughly contained her Bacon Bleu Shroom Burger that she proclaimed to be delicious. For her side she opted for the cheesy tots. Well played. I’m jealous of your bun. And I mean that in a totally non-perverse way. All in all, Beer & Belly is a pretty cool place with a good atmosphere and great service. We also took note of their daily specials, which include everything from the 50 cent wings (Mondays and Wednesdays), $5.99 burgers (Thursdays), and a decent steak special whose price I don’t remember but it sounded decent (Saturdays). Given those specials and his home’s proximity to this place, I think we may know where to find Jerrid on any given night that he’s not actually at home. And I don’t think you’d have to twist our arms to go join him at all. Drinks: Decent options. Just make sure you get the tall beers, lest you be ridiculed for not hanging with the cool crowd. 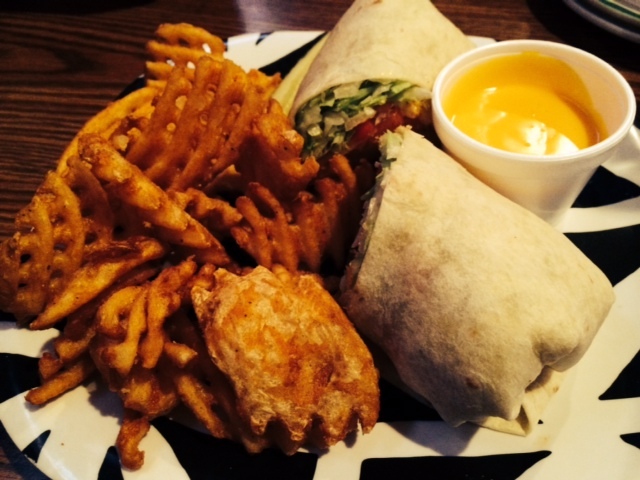 Food: Good bar food, decent specials and portions. Figure out what type of food you like and match it to the day that has that special and you’re golden. Service: I wish we’d gotten our girl’s name, because I would easily request her every time we go into this place. Anyone who can dole out the sarcasm along with a cold beer is a winner in my book. Overall: Great little gem tucked into a strip plaza that I’m sure many people have driven past without even taking note of. Which works out well for those of us who have been there and liked it. Or, as the sign outside more appropriately read “SCORE OR S”. Which just happens to be near a “ESTONE” tire place. Apparently Northfield has some sort of a light bulb shortage in effect. Happy holidays? Scoreboards is located in a strip plaza – where, if we were to return during normal business hours, we could also get a tattoo, work out at an off-name-brand gym, buy a used bedroom set, get our license renewed and score some sweet deals on secondhand clothing. Adventures abound, for sure. There could probably be even more interesting shops in the plaza (seriously, I think all we’re missing is a liquor store and semi-shady looking massage parlor for the win) if not for the fact that Scoreboards takes up what must be three or four storefronts all in itself. For real, the place is huge inside. One side was all pool tables (and a ping pong table, just for good measure I guess) and some high tops, the other was giant space of bar and tables. I think there might’ve been a patio as well, but we didn’t venture that far into the vortex. The place was fairly busy, and it seemed a lot of the tables were regulars from nearby offices. Or groups of people who just really like to wear name tags in public places. Whatevs. Wednesday is also wing night, with 12 traditional or 10 boneless wings for $5 – which seemed to be the dinner of choice for most of the tables. Scoreboards is one of those walk in and seat yourself places – or, as if you’re like us, it goes more like walk in, look around, look at one another, try to look inconspicuous, ask quietly amongst the group if we just sit down or wait, start walking toward a table, look around to see if anyone stops you, sit down and then wonder if the waitress really did see you come in. Because putting up a sign is definitely too much hassle? Exactly. Anyway, after all that it definitely took a hot minute for the waitress to greet us – but once she came over she was bubbly and nice, and when we said it was our first time there she quickly pointed out the specials and the drink list. 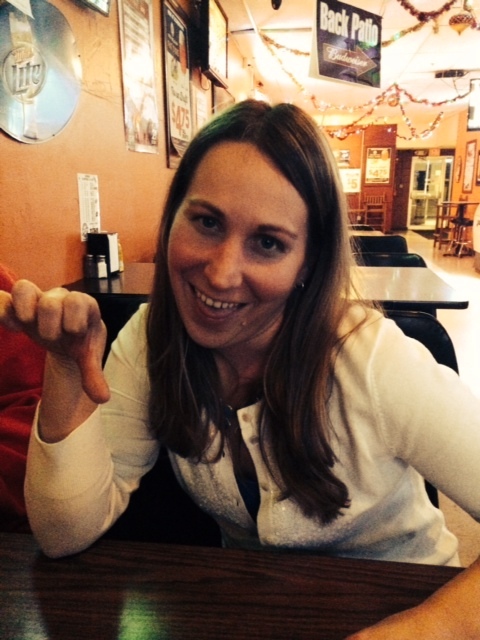 She also scored major bonus points with us when she returned to take our food order, and was able to commit all of it – complete with insane last minute audibles and questions – to memory. And it actually all came out as we intended. For reals. Meanwhile I’m over here forgetting the name of the intern we’ve had at work for six months now, or how my husband of four years takes his coffee. Awesome. So for our meals, Amanda went with the Jack’s Philly Burger. Which by description is supposed to be like a mushroom and swiss burger, but with pepper jack cheese replacing the swiss. Except that Amanda didn’t really think they did that. She said it was a little bland. Which you don’t expect from pepper jack, so I have to believe she was right. I had the Buffalo Chicken Wrap. It wasn’t bad. It had just enough kick to make it tasty, but not too much that it left your mouth on fire. Which I’m thinking is kind of the point. Maybe if they’d put whatever sauce they used on my wrap onto Amanda’s burger we’d be on to something here. That’s cheese sauce, not mustard. Please. The boys had a lengthy discussion about what types of sharing and trade deals they could work out in order to get the most for their money (and grumbling stomachs). Because, well, boys. 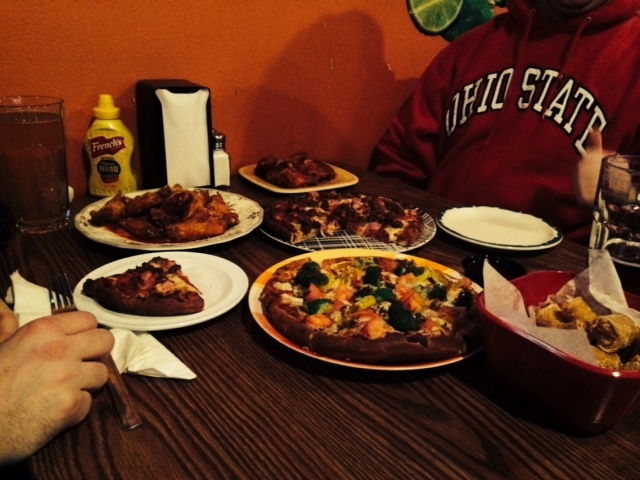 They ended up with two small pizzas (one veggie and one meat lovers – talk about opposite ends of the spectrum) and one and a half wing specials (12 spicy garlic and 6 Cajun BBQ) between the two of them. 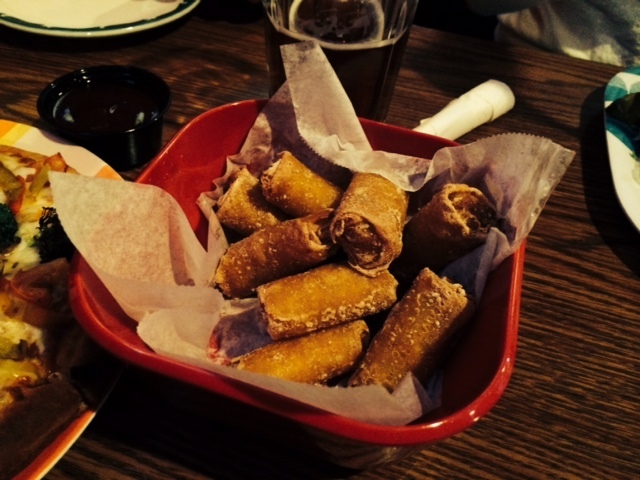 And a basket of mini egg rolls, which technically were meant as a appetizer but showed up with the meal instead. OK, so technically the waitress did get something wrong. Suddenly I feel a little better about my own memory. Maybe. We’re men. We like food. Grr. By far the best thing about the place was the drink specials. Happy hour is until 9, and featured $2.25 large domestic drafts. Amanda and I took advantage of that and went with Miller Lites. Ted went with Christmas Ale – much to the waitress’s delight, who told him “I somehow knew you would pick that. You look like a Christmas Ale kind of guy.” I’m not sure what that means exactly, but none of us could really argue, since he does order that a lot. 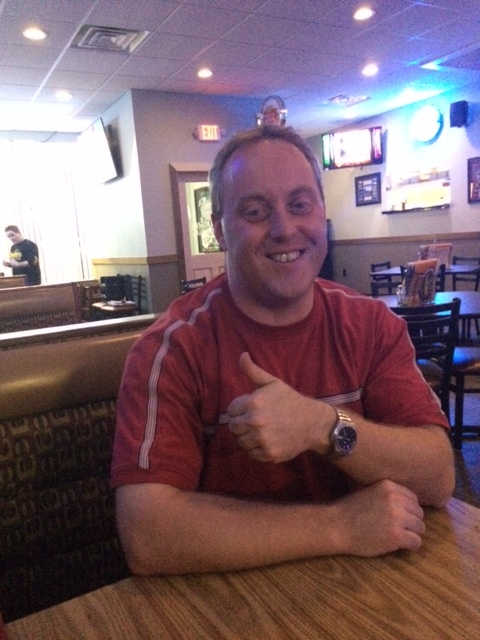 Shane started with a Coors Light and then switched to the Angry Orchard with the shot of fireball for his second (and final) round. He’s living dangerously for a Wednesday night. Overall Scoreboards is probably not a place we’ll end up back at. I was the only one who didn’t really find fault with my meal, which is why I differed from the rest of the group and gave a “thumbs middle” to the rest of their “thumbs downs.” The atmosphere was no different from 27 other bar and grills we’ve been to over the years, and there really wasn’t anything impressive enough for us to put it on the must-return list. Sorry “SCORE OR S” – I don’t see us contributing to your light bulb fund again in the near future. Drinks: Mostly domestics, nothing fancy (other than Christmas Ale, which is more common than fancy in NEO this time of year anyway). Decent drink specials. Food: Mine was decent, but nothing worth seeking out again. The rest of the group would probably choose a lovely evening at the local McDonald’s before a return visit. 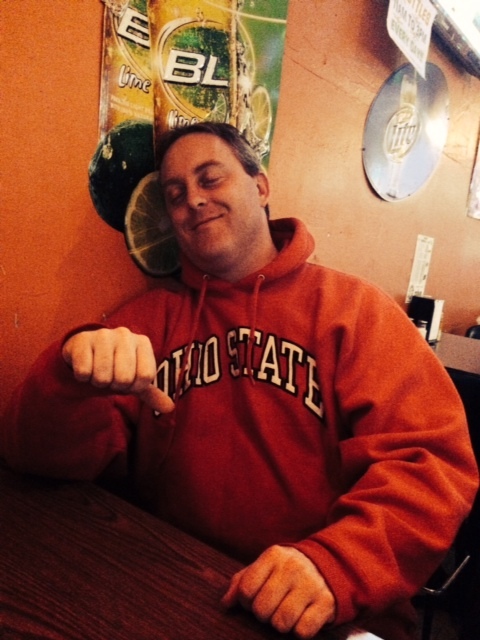 Service: A little slow when we first arrived, but overall personable and good. And props for remembering our incredibly convoluted order without writing it down.